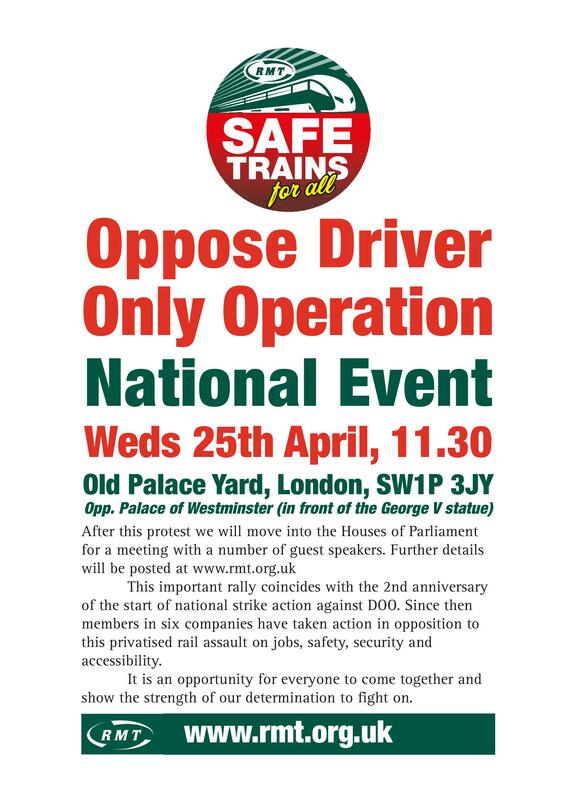 RAIL UNION RMT confirmed today that it will be holding a national protest outside Parliament on Wednesday the 25th of April at 11.30 at Old Palace Yard, London, SW1P 3JY (Opposite the Palace of Westminster and in front of the George V statue). The rally coincides with the 2nd anniversary of the start of RMT strike action on Southern against Driver Only Operation and in defense of keeping the guard on the train. Since the initial dispute began on Southern, RMT members on Northern, Merseyrail, Greater Anglia and South Western Railways have also taken strike action in opposition to the assault on jobs, safety, security and accessibility. After the protest a meeting will be held in Houses of Parliament with a number of guest speakers.